This book presents state-of-the-art technical contributions based around one of the most successful evolutionary optimization algorithms published to date: Harmony Search. Contributions span from novel technical derivations of this algorithm to applications in the broad fields of civil engineering, energy, transportation & mobility and health, among many others and focus not only on its cross-domain applicability, but also on its core evolutionary operators, including elements inspired from other meta-heuristics. The global scientific community is witnessing an upsurge in groundbreaking, new advances in all areas of computational intelligence, with a particular flurry of research focusing on evolutionary computation and bio-inspired optimization. Observed processes in nature and sociology have provided the basis for innovative algorithmic developments aimed at leveraging the inherent capability to adapt characterized by various animals, including ants, fireflies, wolves and humans. However, it is the behavioral patterns observed in music composition that motivated the advent of the Harmony Search algorithm, a meta-heuristic optimization algorithm that over the last decade has been shown to dominate other solvers in a plethora of application scenarios. 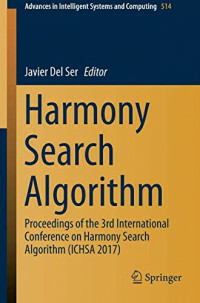 The book consists of a selection of the best contributions presented at ICHSA, a major biannual event where leading global experts on meta-heuristic optimization present their latest findings and discuss the past, present, and future of the exciting field of Harmony Search optimization. It provides a valuable reference resource for researchers working in the field of optimization meta-heuristics, and a solid technical base for frontline investigations around this algorithm.